We Party Down...and Up...and Down Some More! 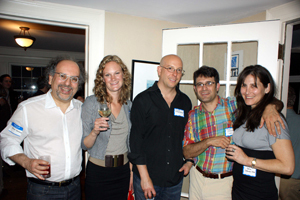 Saturday night, June 12, and the stars were out, gathered at the Whitneyville home of business writer Bruce Tulgan and Pulitzer Prize-winning biographer Debby Applegate, both trustees of the New Haven Review. Present was National Book Award winner Edward "Slaves in the Family" Ball, standing just out of reach on the other side of the bar. (I never did make it over to talk with him, alas.) There, happy tippling, was Hartford bon vivant Nathan Frank, offering sneak previews of his brother Thomas "What's the Matter with Kansas?" Frank's upcoming Wall Street Journal column. Here was Hamden novella master Gregory "Distinguished Gray" Feeley; there memoirist (and trustee) Natasha Pang-Mei "Bound Feet and Western Dress" Chang, now bicoastal, dividing her time between New York and New Haven (and occasionally Russia).It was the third annual New Haven Review soirée, this one celebrating issue #6. Catering by Anna, martini drinking by me. Goatee by novelist and editor Brian Francis "Liberation" Slattery. Republican-party defense by attorney and litterateur Mark Shiffrin. Democratic offense by Joshua "Culture Vulture" Safran. Voodoo consultation by Liza McAlister. Victorian motherhood by Nicole Fluhr. Medical records by Matthew Higbee. Financial advice by Andrew "UBS" Boone. Counter-intuitive discursus by Barry "Why Not?" Nalebuff. Curatorial eye by Helen Kauder. Curatorial gimlet eye by Jonathan Weinberg. Southern flavor by Marc "The Bonfire" Wortman. A touch of class by Steven "Harper's Contributor" Stoll. Doctor on premises: Sydney Spiesel. I left at half past midnight, but I hear many were still there for breakfast. And now for some pictures, all courtesy of the official photographer for the event, Tom Stratford.